Scoffton is a workplace management game that sees you making the most of the massive buffet before you. You have gone to this restaurant with one goal in mind; making sure that you get the most value for the food that you eat within this restaurant, before you end up full and having to go home. With so many options on food, special menu combinations, and other customers at the restaurant, you will have a lot to figure out. This place even has a claw machine for you to try out! Literally everything you ever wanted within this establishment is there for you. Scoffton has a lot of pieces, all in a very unique 90s cartoon style. I quite enjoy the aesthetic within the game, I found that it looked cute and unique in the best sort of ways. The game does take a fair amount of time to set up, as each station gets different foods; a salad bar, a dessert bar, a buffet table of meat, a sidebar of items yet to be placed where they belong, cards for the lost and found, as well as the claw machine — there just is a lot to set up. Once everything is placed, you can start the game. Collecting various food items and consuming them does take time. Your goal is to gain a lot of points — and there are a bunch of ways to do it. 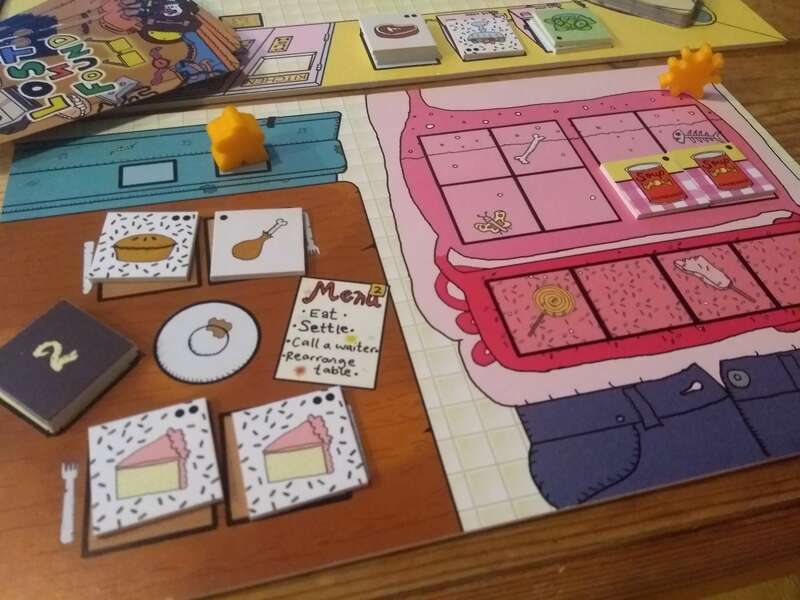 The most common way of gaining massive amounts of points is to create the recipes on menu cards in the game within your stomach. Your stomach, like most people’s real stomach, has a limited amount of space. Each menu item is 4 tiles, and once one of your two regular stomach areas are full of a dish, that keeps you full. You also have a desert stomach that can be filled as well! If there are items in your stomach that you don’t want, you can go to the bathroom and get rid of them — still gaining points for them as well. This is good for longer games, but as soon as someone is full, Scoffton does end. Before you can get munching, you need to put items on your table. These foodstuffs can be sometimes given to you or forced upon you — but you can call a waiter to take away the items you don’t want. As I said previously, Scoffton has a lot of pieces! 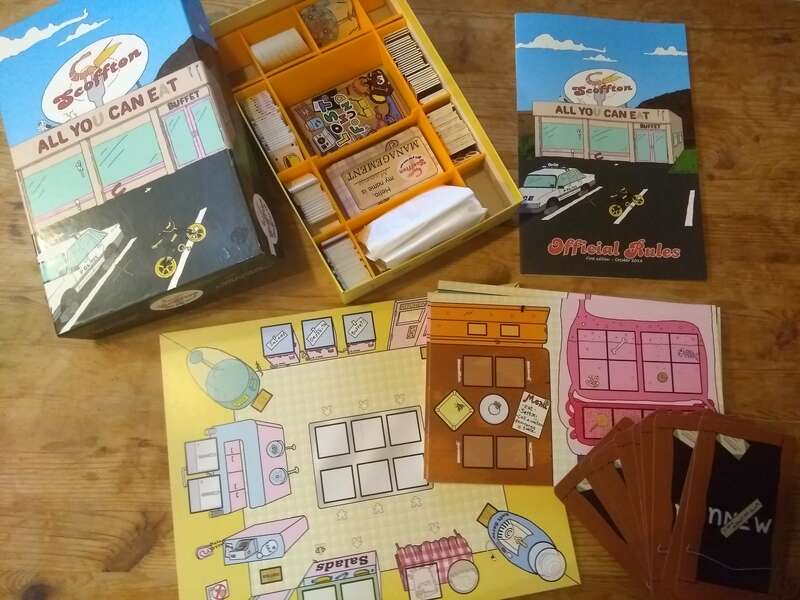 The box contains: a rule book, a main restaurant board which holds many of your food tiles, four player belly boards (which have your table and stomach on them), twelve diner meeple characters (three of each color), four sneeze tokens (one of each color), twelve spill tokens, sixty-two food tiles, forteen coffee tiles, fifty-four VFM tiles (points tiles), eighteen claw machine cards, sixteen management cards, thirty lost and found cards, and nine menu selection cards. Yes, that is a lot of things! Each player does get three of the same color meeple as well as a sneeze of the same color, as well as a belly board. Other than that, the rest get placed in and around the restaurant. As for turns, one player starts by placing down one of their meeples. They can place their meeple in a number of places; onto a lost and found tile, onto a food bar space, by the claw machine, or on their table. They could also sneeze on a spot, contaminating the food there. The next player, going clockwise, will then place one of their meeples. This will continue until everyone has placed all of their meeples where they want them. Then, a management card is flipped over. This is an action that is happening at the restaurant, to all of the players. 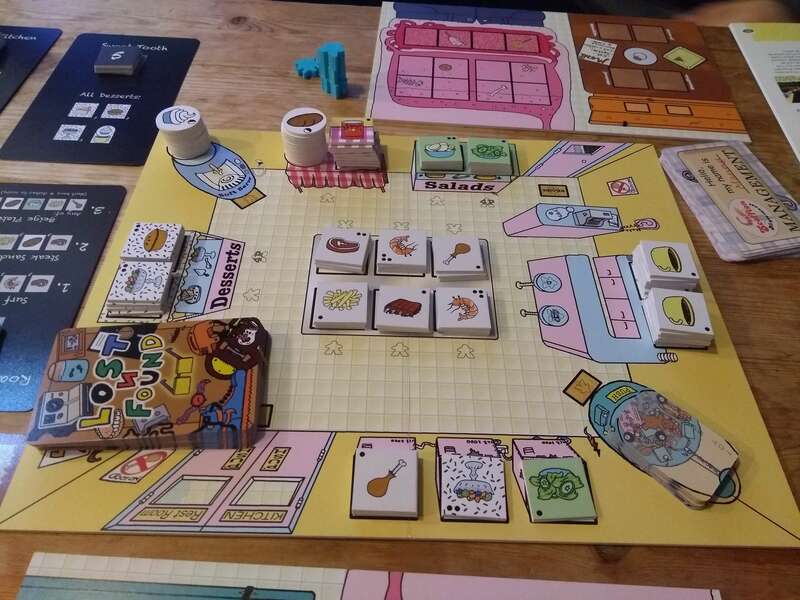 It can be cleaning the floor, restocking food (which can change what some of the meeple selected at the buffet, giving each player bread, forcing them to eat bread, and more. Once management is done, one by one you will continue around the group, resolving one meeple at a time. Eventually, you will have your meeples back and have resolved all of the things you wanted. This means collecting food, trying out the claw machine, eating or shifting items around your stomach, cleaning your table off, going to the bathroom, moving food around your table, getting coffee, collecting and using a lost and found card, and more. Like a real buffet, there is a ton that can be done. Your goal is to have the most points at the end of the game, so you will need to plan and think about your moves and try to maximise your stomach space! I quite enjoyed Scoffton. 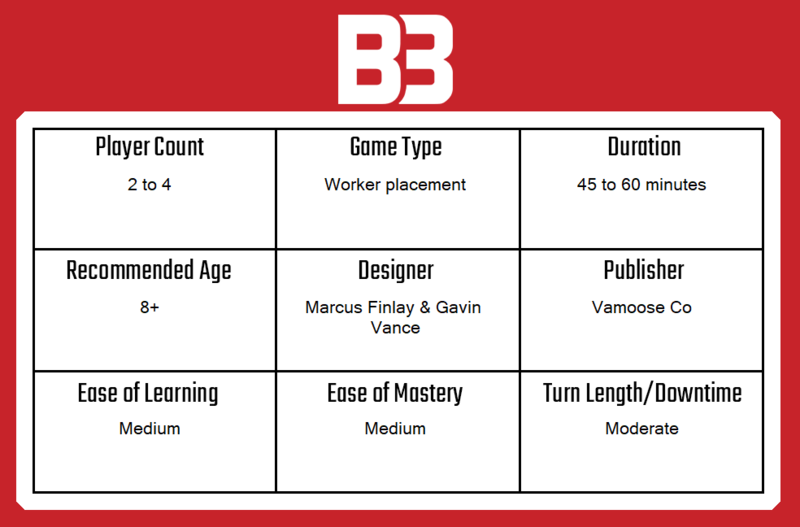 Because of the huge amount of things you can do, turns can be very slow with new players or people who are indecisive. With that said, once you have played a few times, people really get their moves decided in a much quicker fashion. With all of these options and ways to earn points, I spent a lot of time trying to get complete recipes in my stomach, and eat them. This is a challenge — and with so many other ways to earn points — sometimes I found that I probably should have gone for lost and found cards or worked on blocking off others. Soon it becomes strategic sneezing, blocking off areas, and trying to use the bathroom to gain extra points with the random stuff you ended up with. The game itself does feel like a fun way to experience a buffet — and I do love food games. Crafting the menu items, taking chances at claw machines, and complaining to the staff all makes for a great experience. Though I really enjoyed the game, the box the game came in was a bit… weird. As there are so many different components, all of various sizes, the box had a 3D printed divider that everything slotted nicely into. This seemed super awesome — but the cards itself don’t actually stay within the divider and instead get stuck below it. I found that moving the pieces around in this divider was also not the best. It needs to be sort of attached to the box — or have a shelf at the bottom keeping things in. I do hope they fix that in the full additions of the game. The manual to explain such a complex game is well written, though I wish it specified if cards should be placed face up or face down, as the first time reading through the instructions can be confusing. Once you figure it out though, it’s pretty straight forward. The claw machine has so many lose cards, it’s pretty dang realistic, and that is something I very much appreciate. One of the three shrimp cards can also give you food poisoning, which again, is great attention to detail. Scoffton really does stay as close as it can to the theming of the game. Though it’s not a game I would be bringing around in my bag, it’s definitely a game I will be playing again. A copy of Scoffton was provided for review purposes. You can find out more about it on their Kickstarter.